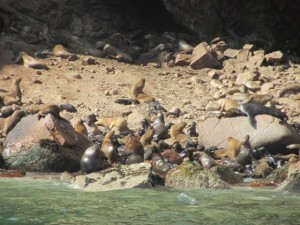 After the Nazca lines we decided to take in some of Peru’s natural beauty with a stop at Paracas and Islas Ballestas – and the sea lions and birds. We’ve never seen so many birds. 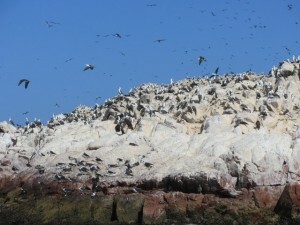 The island is black – covered in ‘guano’ birds – gulls, blue footed boobies, cormorants and pelicans. The ‘guano’ is sold as fertilizer. We saw many seals in Antarctica but we’ve never seen so many as here. We can hear some grunting and then we see the sea lions. There are hundreds of them on a beach in a cave on the island. There are pups, females and the huge males. Amazing. For about 45 minutes we circle the island looking at the birds and the seals. The seals play in the water or loll about on the rocks. The birds swoop or just sit and watch. What a place! The sand dunes behind Paracas were part of the Dakar circuit earlier in the year. We can’t resist the chance to take a dune buggy ride over them. 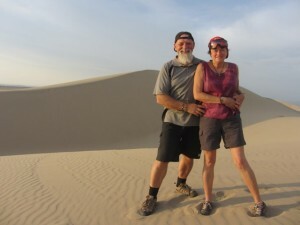 We career up and over dunes more than 200 metres high. It is a blast. 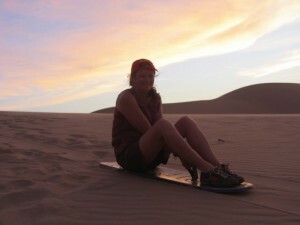 To round it off we take a sand board down one of the dunes just as the sun sets – the end to a perfect day. 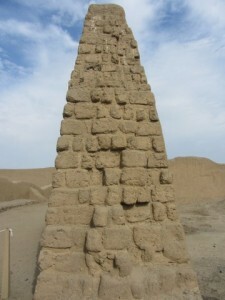 North of Paracas there are many ruins from pre-Inca settlements. 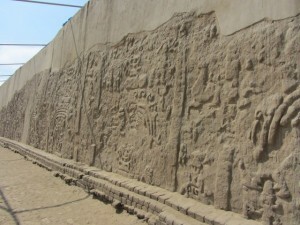 At Huanchaco we explore ruins from the Moche era – 400 to 800 AD. What has been preserved in the dry climate and hidden under sand for centuries is amazing. Despite the passing of the centuries you can still see the colour on the carvings on the stone wall. The God of the Mountain looks down on us from centuries ago. museum has many of the gold, silver and ceramics that were found in the tombs inside the temples. These people practiced human sacrifice. Their warriors would battle it out and the losers would be sacrificed to the Gods. To ease their pain they were given a hallucinogenic drug made from the San Pedro cactus. 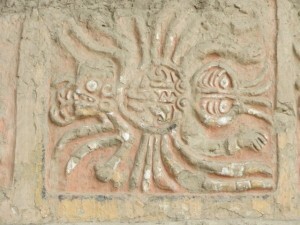 The Moche people were overrun by the Chimus around 800 and the power base was shifted to Chan Chan. The climate here assisted with the preservation of the palaces and temples. We visit the Rainbow Temple and Chan Chan’s Palacio Nik An. The Rainbow Temple is quite simple in design with some beautiful friezes on the walls. It might be small but it is impressive. Palacio Nik An is massive. There are three distinct areas which they think were the public area, the king’s private area and the burial area at the back. All the tombs here were empty, robbed centuries ago. The walls are designed with fishnet like waves and circles, fish, sea birds including pelicans. There are massive storage areas were the people would come and leave things for the royal family. The king would then redistribute this taking the best for himself. 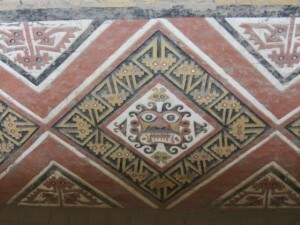 North of Huanchaco is the museum housing the relics found inside the tomb of the Lord of Sipan. No photos allowed here where the gold, gems and ceramics fill room after room after room. 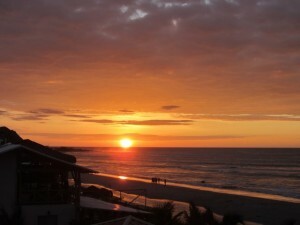 We are moving north from Peru into Ecuador and spend our last night on the beach at Zorritos – what a sunset! We enjoyed the Ballestos Islands too except for the bird had a direct hit on me. It’s wonderful to follow your journeys. You are an amazing couple. Enjoy.